Caesar has a home! 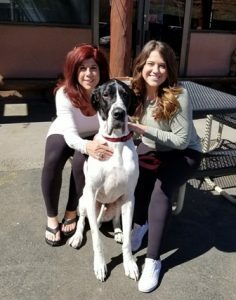 - Rocky Mountain Great Dane Rescue, Inc.
Caesar has a home with Giovanna and George in Albuquerque NM! Giovanna and George were excited about Caesar the minute they saw him on the website! Caesar will share his home with Shay, a 5 year old Great Dane, Isaiah, and 8 year old Dane mix, and Joey, a 7 year old cat. Together they will enjoy walks around the neighborhood, short hikes, and going everywhere the family goes. They also hope to foster in the future, and plan to bring Caesar to some Colorado events when they can. Both Giovanna and George are home during the day, so Caesar will have lots of love and attention! We are so happy for Caesar and his new family! Way to go sweet boy!